The government agency responsible for protecting citizens from environmental dangers is the same agency that is endangering its employees through asbestos exposure, concludes the group’s own inspector general. Environmental Protection Agency (EPA) Inspector General Arthur A. Elkins Jr. said EPA own policies threaten public health and potentially endanger the lives of workers. He made that conclusion in a memo this week. By some accounts, his report leaves little room for confusion on where the inspector general stands on asbestos exposure and how the agency should structure policies around it. Within the formal memo, Elkins goes into details about the background of asbestos policies within the agency and how violations may have occurred. Asbestos exposure is a known cause of malignant mesothelioma cancer, a rare and aggressive illness that has no known cure. Mesothelioma represents about 0.3 percent of detected cancers. The inspector general’s office learned of allegations that the EPA was using unauthorized methods for demolishing asbestos-containing buildings. Elkin then made Jackson aware of the potential issues and suggested internal reviews to ensure misconduct is not occurring. The danger of demolitions is when buildings that contain asbestos receive structural damage from large machines, resulting in the release of asbestos fibers into the air for people to breathe. Asbestos fibers become fatal when they are ingested and get lodged in human organs like the lungs or the ling of the lungs, in which they gradually scratch and damage the body eventually causing cancer. This process occurs over a 20 to 50 time period. According to Elkins’s document, the EPA first issued policies involving asbestos and demolitions in 1973, with the Asbestos National Emission Standards for Hazardous Air Pollutants (NESHAP). This policy was designed to protect citizens by reducing asbestos exposure during the demolition of buildings and related events. 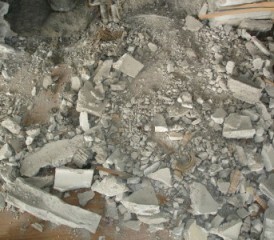 It mandated that asbestos-containing materials must be properly removed by trained technicians before the demolition occurred. By 1999, it was known that the EPA considered varying methods of demolitions that leave asbestos-containing materials in the building prior to demolition. The buildings would be wetted during this demolition process to limit the exposure of asbestos fibers in the air. The issue is that the EPA had not proved that the ‘wet’ process in fact does protect asbestos fibers from entering the air. Therefore, the method was not approved for use. Elkins reports that through his research, these unapproved methods were actually being “used or considered” at various locations across the country. Sites named within the document include Washington’s Hanford Superfund Site and a Kentucky gaseous diffusion plant. The inspector general clarifies that any use of these unapproved methods is “counter to EPA regulations” and put the safety of the general public at risk. The report continues by stating that such policies and actions may also be putting the EPA’s own employees in tremendous danger. The agency has video evidence that shows agency employees at demolition tests sites without proper protective equipment, which is also a possible Occupational Safety and Health Administration (OSHA) violation. Footage shows potentially asbestos-tainted dust at these test locations where employees were openly exposed. These recorded test sites took place in Arkansas and Texas. Elkins concludes in his report that the EPA needs to immediately send the message to all staff that all NESHAP and OSHA policies regarding demolitions need to be enforced, reducing any potential asbestos exposure hazards. He recommends that EPA Administrator Jackson continue to assess whether approved actions caused employees to potentially be exposed to asbestos, and if so, notify those employees immediately so that they can receive any necessary medical care. This is not the first time that the EPA has found itself in the crossfire of criticism. Additional pressure recently was placed on the agency because of its handling of other asbestos-related issues, notably that of Libby, Montana. Reports from The Associated Press claim that the EPA was aware that asbestos-tainted materials was being shipped from hazardous sites to other states and did nothing about it. The recipients of these materials were unaware of the hazard while the EPA may have known all the while. Now additional cleanups and testing are required to determine the full extent of danger to this situation as well. Since her start as top official at the EPA, Jackson has stated her determination to cleaning up sites and areas contaminated with asbestos. Evidence from reports like Elkins’s may add to this list.